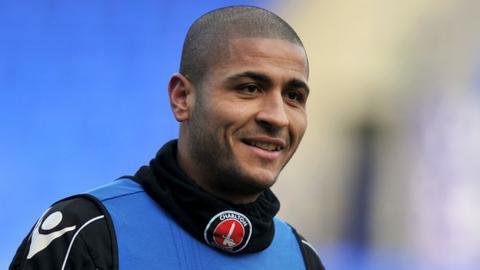 Leon Clarke hit Scunthorpe United's early winner as Shrewsbury suffered their first home defeat in 34 matches. After coming off the bench to earn the Iron their first point of the season in last Saturday's 1-1 draw with Sheffield United, ex-Wolves man Clarke went one better by claiming all three points. Clarke struck on five minutes, heading in fellow striker Karl Hawley's cross. That completed a double for boss Alan Knill, whose Bury side were the last to win at the Meadow - back in March 2011. Shrewsbury Town have now not beaten Scunthorpe United on home soil in five attempts since August 1998. It ended a run of 34 home games without defeat, victory lifting Scunthorpe, who had lost their first four games, off the bottom of League Two. Scunthorpe made a flying start, Hawley's right-wing cross being headed in by on-loan Charlton striker Clarke. Knill's side could have been out of sight by the break as lively winger Mark Duffy, set up by Hawley, was denied by an excellent point-blank save from Town keeper Chris Weale. Shrewsbury found chances hard to come by, but striker Tom Bradshaw, handed his first start of the season, squandered a golden opportunity when he fired wide with only keeper Sam Slocombe to beat. The visitors continued to look the more dangerous side in the second half, Clarke coming close to a second when his goalbound shot was blocked on the line by Town defender Darren Jones. "We've got to take a look at the way we played. Having given them the lead with a terrible goal to concede from a throw-in, we were second best in the vast majority of the game, in the vast majority of the positions. "We didn't deserve anything, to be perfectly honest. "It's other people who look at how long we've not been beaten at home. "But, to me, we've not played well and lost the three points - that's the crucial thing." "We're all delighted. It gets our season going. We said we wanted to build on the point from last Saturday. If I'm honest, we deserved three points. "I just thought the work ethic was fantastic and we looked a threat everytime we went into their half. "When it was needed, we put our bodies in the way to keep it out of our goal. "The good thing about it was I didn't think we panicked."